HALLIE EPHRON: One of my writing buddies, Suzette Standring, is one of the bubbliest, most fun people ever to hang out with. She's a talented, well published columnist who writes profound and funny at the same time. Recently she "put herself out there" by stepping up to the podium for a Moth-like story slam -- as in impromptu telling a personal story. Sounds terrifying to me. But she's one of those people always up for a challenge and... well, I'll let her tell it. 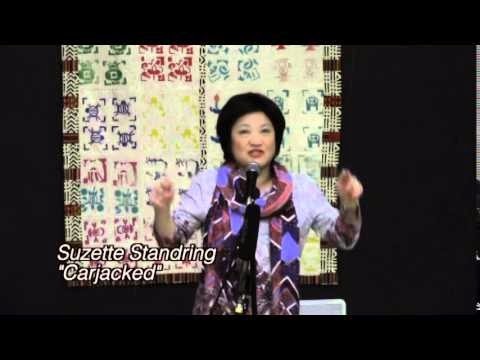 SUZETTE STANDRING: I often ask, “Now what was the purpose of that?” Frankly, I’ve long wondered why I was carjacked in 1995, and now I know. It was to catapult me onto the comedy stage. (The Lord works in hilarious ways). So here’s the deal. I’m an author. I teach writing workshops. I’m a syndicated columnist. Standup comedy was never part of the repertoire. I’m not that gal. After the Story Slam, the host Andrea Lovett said I was a natural comedian. “You need to meet Robin Maxfield, the founder of Boston Comedy Chicks. I’m going to send her an email about you,” she said. It took four email “howdy do’s” and boom! On April 19 I’ll be part of the comedy lineup with Boston Comedy Chicks at Doyle’s Pub in Jamaica Plain. HALLIE: Honestly, though I am addicted to THE MOTH, participating in a story slam would make me so nervous, right up there with my nightmares about taking an exam for a course when I've never been to class. Suzette has such pluck and nerve. What about you? Is there a funny/poignant/surprising/interesting story you've lived to tell about? Have you go the nerve to participate in a story slam? Oh, my goodness . . . I am most definitely not the one to participate in a story slam. I could have a panic attack just thinking about it. Stories to tell? Probably one of the many twin stories from our school days. I could see myself doing this. Right now the story would be about all my contortions to eat and type (and all other handed activities) as a leftie. But there's also the time I got to research the inner workings of a police station because of, shall we say, an unexpected opportunity. And no I'm not divulging when or where! I don't even want to know what one-ups a carjacking. I could do this. Probably. I'd most likely tell the story of my very first SinC writing retreat, how we locked ourselves out of the rental house and our, um, creative method of how we got back in (cough, cough). Edith, I could SO see you doing this. But yeah, you got to be loose and limber. Mary, that's a story I'd like to hear... how DID you get back in? Um, will you be at Bouchercon? I'll tell you the whole tale, which really needs to be told over a glass of wine. Short story: how would you expect twelve crime fiction writers to get back into a locked house? Crime fiction writers trying to break back into a house, now that's a practical writing exercise, Mary Sutton. I teach, but public storytelling is not my thing, and I only got my confidence up through Toastmasters. Edith Maxwell, the inner workings of a police station! It wasn't a DUI, was it? Just kidding! Any other folks who've gone to Toastmasters? I've heard such great things about it. So many stories! I could do this, and I'm not the world's best speaker. But there's something about telling a story, as opposed, say, to delivering a paper on microscopic stone tool edge wear--people in the audience are prepared to be entertained, to enjoy the experience of a story. A sweet story to share: my two blond-haired charmers, aged 3 and 4, wanting to the know the story of Frankenstein because the sitter's husband had a totem-pole with a Frankenstein face. Both listening transfixed, thoughtful. Trying to explain why people were afraid of the monster. Then a little voice piping up: "We would teach him to be human, Aunt Flora." FChurch, how deep. I was moved by the heart of your little innocents. BTW If anyone wants to check out a Toastmasters meeting, come to 16 Nevada Road in Quincy 02169 on Monday, March 30 at 7 p.m. Coincidentally, Toastmasters Quincy 675 is having an open house. You can see how it works. I was surprised at how many shy people have improved in leaps and bounds. A very kind and supportive group. Maybe I'll see some of you there. Two friends (not writers) swear by toastmasters. Funny storytelling is way easier than standup comedy. I bet all the writers here could dominate at story slams. My daughter Molly is a brilliant storyteller. Many times she's brought me to tears of laughter. It's a gift, and really I think you can be a good writer but not the greatest at standup storytelling. Exhibit A: me. When I went to a comedy workshop to hone my story for April 19, I don't have the level of wit and spontaneity for standup comedy, which is so demanding. But it's fun to try new things. I kept telling myself, "You're here to polish the carjacking not to open for Chris Rock." But there are tools I learned that I could apply to public speaking and teaching. I can't recall ever being particularly nervous about speaking before a group. Even in my high school days of speech contests, I enjoyed the activity. However, I do wonder if I would have a case of nerves speaking in front of my favorite authors, like the Jungle Reds. I still think I'd enjoy it. I often feel like the kid in the classroom waving her hand frantically (something like Hermione Granger) because there's something you just have to add to the topic at hand. I guess I look at public speaking as a form of a large group discussion in which it's my turn to take the floor. One of my favorite stories that I can imagine telling in a story slam is the time another bookish friend and I traveled out of town to see author Diana Gabaldon at a bookstore. My friend and I were passionate fans of the Outlander series, and at that time, about six or seven years ago, I hadn't met a lot of authors. So, we were super excited. I won't tell the whole story here, but suffice it to say the following. We couldn't hear Diana very well, we couldn't decipher what she signed into our book, we had to drive back to our inn (a Shaker settlement that I had picked out in the middle of the countryside and about 30 miles from author event)during a torrential thunderstorm that produced a strange faucet like pouring on the windshield, we got lost on the backroads (good time to remember that there are no streetlights or really any lights in the dark, stormy night of the deep countryside), finally got back to inn and sloshed through water to our building, climbed three flights of tricky stairs, fell into bed, got up the next morning to no electricity, and had lukewarm coffee and mildly warm breakfast (we were the lucky last ones even receiving breakfast). In short, it was one of the best times we've ever had. We still laugh uncontrollably over it. Suzette, I so enjoyed your "car jack" story, and your delivery of it was perfect. 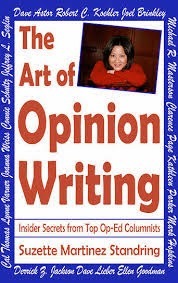 The last time you visited Jungle Reds, I bought your book on opinion writing, and I love it. I'm a big fan of editorials and opinion columns, and I used to love teaching students writing for persuasion pieces. Now, I will be getting your book out again today. Thanks for sharing your story with us today! Kathy Reel, what a terrific post, so funny and descriptive! I know what you mean as I, too, feel shy when I'm in the company of writers (like Jungle Reds!) of the soaring realms, and I feel like a clipped cherub. But I do believe it brings one's game up to operate where the bar is so high. Also, thank you for your great encouragement. I really loved your story. More! More! Kathy Reel - that is a great story! I've met Diana Gabaldon a few times and she's really really nice and so not full of herself - she'd crack up reading your anecdote. So enjoyed your clip Suzette! thanks for visiting. I agree with those who've said storytelling is easier than stand-up comedy. Don't you think part of the trick is figuring out how much to say? You can ruin a good story by droning on past the punch line, but can also ruin it by not telling quite enough. Lucy Burdette, isn't that just the secret to life? When to stop talking. LOL! There is such an art to standup and verbal storytelling, and what a novice I am! Hallie, I agree that Diana Gabaldon is a lovely person, and I will be seeing her again in less than a month at the Southern Kentucky Book Festival in Bowling Green, Kentucky (about an hour from me). My friend that went with me on that wild and crazy trip is going with me this time, too. We plan on taking the books she signed and asking her what she wrote. Someone suggested it might be Gaelic. Sharing personal stories is easier for some writers than others.